Fifty years ago — so I am told — there was an enormous man-made lily pond in our backyard. Even had I not been told this, I would have known. The crumbling remains of the stone wall that lined the edge of the pond are still poking up through the grass in our yard, making a semi-circle under the shadows of the chestnut trees. Several years ago, while clearing away brush, I discovered the buried casing that used to house an underwater light. But there’s a sturdier, more stubborn reminder of the Lily Pond That Was: two thick patches of bamboo. Oh, it’s lovely stuff, I’ll give you that — tall, leafy, and green almost year-round. Even the slightest wind hisses as it passes through, making the evenings sound warm and exotic. But it grows everywhere. Its root system — which looks like a human spinal cord — dips and turns and tangles and snakes its way through my yard, weaving between tree roots to shoot up a pencil-thin bamboo shoot at the base of our Japanese maple. It erupts through the cracks in the low stone wall, and spurts up a row of prison bars in the middle of the lawn. And it grows fast. 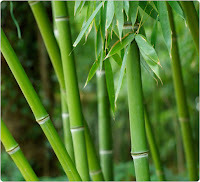 The morning after a rain storm, I’ll find three-foot stalks of bamboo hunkered together in the corner of the yard. If I catch it fresh, I can usually kick them over — the thicker stalks make a satisfying hollow whonk! as I punt them with my boot — but if I don’t cut it down within the first day or so, the trunks quickly thicken up to the point where I either need to run over the thinner shoots with my riding mower, or cut the thicker trunks down with tree loppers. It’s a war of attrition, and after several years of fighting these little skirmishes, I’ve actually managed to clear away the largest patch in the middle of the yard — the patch that had forced one chestnut tree and the Japanese maple to twist their branches away from the thick mess of bamboo for over thirty years. I’ve lopped and sawed down over a hundred bamboo trees, leaving behind stumps that gradually became rock-hard stubs that twist ankles and bust lawn mower blades. Only now have they just started to decay enough that I can force them and their stubborn root balls out of the ground by whacking them sideways with a sledgehammer. In this area, at least, they don’t appear to be coming back. It’s a different story down in the corner of the yard, where a thick patch of the stuff still stands there in exotic defiance. Like Sisyphus pushing his rock, I’ll continue to mow down new shoots each week, only to have them erupt anew, thicker and greener, the next wet day. It would almost be therapeutic, if it wasn’t so frustrating. This entry was posted in bamboo and tagged random musings. Bookmark the permalink. You know what you need? A couple giant pandas. Boy, and how. . .
I’m so glad I resisted the urge to plant some! As much as I’d like the privacy it brings, bamboo is a menace in the average homeowner’s yard.